A while ago we wrote about the surfeit of options India have in their pace bowling ranks. Hopefully things are getting a little clearer. For the record, we’d go with Zaheer Khan, RP Singh and Irfan Pathan, which would perhaps be a little harsh on Sreesanth if it weren’t for the fact that you can guarantee that at least one of those three will be injured at any one time. RP Singh today proved what a masterful swing bowler he already is. Australia were undone. Whether it was a left-hander or a right-hander, the ball arced away from the batsman. That curving path of the ball’s somehow quite pleasing even if there isn’t a wicket, isn’t it? Irfan Pathan aped him and took a couple of wickets and at one stage Australia were 61-5. It’s that 2005 story again: the swinging ball undoes the Aussies. It seems so simple, but so few teams manage to put it into practice. The truth is, it’s not as simple as just swinging the ball. This was superlative bowling. One thing we’re wondering is whether India could have produced this sort of bowling sooner if they’d had more preparation before the first Test. Or indeed any, because of course the warm-up match was pretty-much washed out and the bowlers didn’t even see the ball. Maybe the Indian Cricket Board would be better off arranging a more forgiving fixture list for their team and supporting them that way, rather than threatening to bring everyone home every time there’s a disciplinary matter with one of their players. RP Singh bowling like a seasoned veteran, at the grand old age of 22. Looks like your comment about Sharma giving the Aussies problems on their tracks is being justified as well. I don’t know who he’s trying to fool with his goatee and claim to be 19 though, he’s clearly no older than twelve. 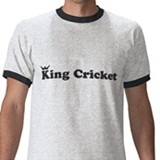 Quoth the BCCI – “They are professional cricketers. Why should they need preparation?” Also (they didn’t say this, but this is what they mean) “They are professional cricketers. Why should we provide medical care and rehabilitation when they are injured? They can afford their own doctors.” It looks good now; let’s hope they can all stay in one piece until the end of the tour. That’s one hell of a quote. Where was that from? Uhh . . . my recollection was slightly off, but not by much. Here is the quote by BCCI secretary Niranjan Shah: These are professional cricketers and must learn to adapt quickly.”. There’s quickly and there’s quickly though, isn’t there? That’s still pretty ludicrous.